SAN FRANCISCO (AP) — Security guard Eric Leon watches the Knightscope K5 security robot as it glides through the mall, charming shoppers with its blinking blue and white lights. The brawny automaton records video and sounds alerts. According to its maker, it deters mischief just by making the rounds. Leon, the all-too-human guard, feels pretty sure that the robot will someday take his job. 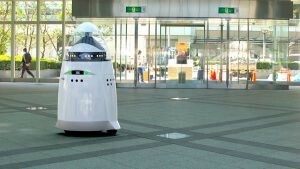 Even in the technology hotbed stretching from Silicon Valley to San Francisco, a security robot can captivate passers-by. But the K5 is only one of a growing menagerie of automated novelties in a region where you can eat a delivered pizza made via automation and drink beers at a bar served by an airborne robot. This summer, the San Francisco Chronicle published a tech tourism guide listing a dozen or so places where tourists can observe robots and automation in action. Yet, San Francisco is also where workers were the first to embrace mandatory sick leave and fully paid parental leave. Voters approved a $15 hourly minimum wage in 2014, a requirement that Gov. Jerry Brown signed into law for the entire state in 2016. And now one official is pushing a statewide “tax” on robots that automate jobs and put people out of work. It’s too soon to say if the effort will prevail, let alone whether less-progressive jurisdictions might follow suit. The tussle points to the tensions that can flare when people embrace both technological innovation and a strong brand of social consciousness. Such frictions seem destined to escalate as automation makes further inroads into the workplace. One city supervisor, Norman Yee, has proposed barring food delivery robots from city streets, arguing that public sidewalks should be solely for people. Jane Kim, the city supervisor who is pushing the robot tax, says it’s important to think now about how people will earn a living as more U.S. jobs are lost to automation. After speaking with experts on the subject, she decided to launch a statewide campaign with the hope of bringing revenue-raising ideas to the state legislature or directly to voters. “I really do think automation is going to be one of the biggest issues around income inequality,” Kim says. It makes sense, she adds, that the city at the center of tech disruption take up the charge to manage that disruption. “It’s not inherently a bad thing, but it will concentrate wealth, and it’s going to drive further inequity if you don’t prepare for it now,” she says. “Preposterous” is what William Santana Li, CEO of security robot maker Knightscope calls the supervisor’s idea. His company created the K5 robot monitoring the Westfield Valley Fair mall in San Jose. The private security industry, Li says, suffers from high turnover and low pay. As he sees it, having robots handle menial tasks allows human guards to assume greater responsibilities — like managing a platoon of K5 robots — and likely earn more pay in the process. Li acknowledges that such jobs would require further training and some technological know-how. But he says people ultimately stand to benefit. Besides, Li says, it’s wrong to think that robots are intended to take people’s jobs. The question of whether — or how quickly — workers will be displaced by automation ignites fierce debate. It’s enough to worry Bill Gates, who suggested in an interview early this year a robot tax as a way to slow the speed of automation and give people time to prepare. The Microsoft co-founder hasn’t spoken publicly about it since. A report last year from the Organization for Economic Cooperation and Development concluded that 9 percent of jobs in the United States — or about 13 million — could be automated. Other economists argue that the impact will be much less drastic. The spread of automation should also generate its own jobs, analysts say, offsetting some of those being eliminated. Workers will be needed, for example, to build and maintain robots and develop the software to run them. Technological innovation has in the past created jobs in another way, too: Work involving new technologies is higher-skilled and typically higher-paying. Analysts say that much of the extra income those workers earn tends to be spent on additional goods and services, thereby creating more jobs. What about people who lose jobs to automation but can’t transition to more technologically demanding work? Lawmakers in Hawaii have voted to explore the idea of a universal basic income to guarantee wages to servers, cooks and cleaners whose jobs may be replaced by machines. Kim, the San Francisco supervisor, is weighing the idea of using revenue from a robot tax to supplement the low wages of people whose jobs can’t be automated, like home health care aides. Doug Bloch, political director of Teamsters Joint Council 7 in Northern California and northern Nevada, said there have been no mass layoffs among hotel, trucking or food service staff resulting from automation. But that day is coming, he warns. Part of his responsibility is to make sure that union drivers receive severance and retraining if they lose work to automation. Similarly, friends Steve Simoni, Luke Allen and Gregory Jaworski hatched the idea of a drink-serving robot one night at a crowded bar in San Francisco. There was no table service. But there was a sea of thirsty people. “We all wanted another round, but you have to send someone to leave the conversation and wait in line at the bar for 10 minutes and carry all the drinks back,” Allen says. They created the Bbot, a box that slides overhead on a fixed route at the Folsom Street Foundry in San Francisco, bringing drinks ordered by smartphone and poured by a bartender — who still receives a tip. The bar is in Kim’s district in the South of Market neighborhood. Simoni says the company is small and it couldn’t shoulder a government tax. But he’s glad policy makers are preparing for a future with more robots and automation. “I don’t know if we need to tax companies for it, but I think it’s an important debate,” he says. AP Writer Christopher Rugaber in Washington contributed to this report.